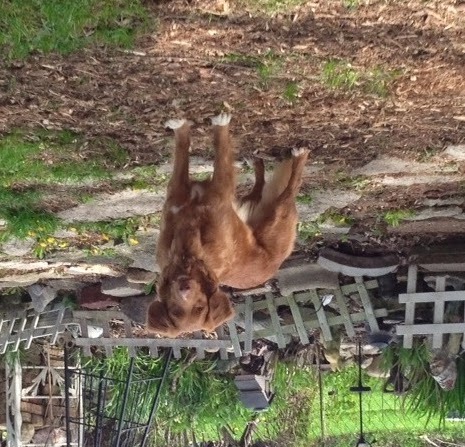 Life Among Tollers: Are you a good dog, or a bad dog? Are you a good dog, or a bad dog? We've been known to utter those words in our household with the same inflection Glinda asked Dorothy in The Wizard of Oz if she was a good witch or a bad witch, though thankfully our current canine residents don't respond back with "but I'm not a dog at all!" Only Gem would have ever contemplated that retort. It's all a matter of perspective, of course. I'm sure June and Lark think they're being very good dogs when they're digging furiously into the comforter, blankets, sheets and pillows on our bed in order to make themselves the perfect nest for napping. Though their efforts are momentarily amusing, we humans have a different perspective and their activity usually gets them banned from the bedroom until the next time we forget to close the door. As the self appointed border patrol of our small homestead, Lark certainly thinks she's being a good dog when she races out to expel any critters who might have had the audacity to set foot or claw in our backyard. Her zeal extends beyond the boundaries of our yard to include any walkers, joggers, bikers or skateboarders who happen to be within her line of vision as she peers through the slats in the fence. The ruckus she makes is disruptive and embarrassing at times, but she hardly ever looks as pleased with herself as she does after completing her rounds. Recently she's been a bit less vocal in her efforts, though just as energetic. Could this be a sign of maturity? The next time I am confronted by a less than desirable behavior I will try to remember, from their perspective, they are likely being a very good dog indeed. If being quieter is a sign of maturity maybe there is still hope for Teela. These days she proudly announces the presence of any deer, squirrel, or rabbit who has the audacity to come near our homestead. I do always try to appreciate that Emme alerts us if a leaf has moved outside as well.